MONDAY, April 11, 2016 (HealthDay News) -- Two out of five retired National Football League players may suffer from traumatic brain injuries, a small study suggests. Brain scans of 40 former NFL players, age 36 on average, found that nearly 43 percent had significantly more damage to the brain's white matter than healthy adults the same age, researchers said. Also, testing showed about half had significant problems following through on goals, and more than two out of five had learning, memory or attention problems. "This is another piece of the puzzle that playing football places people at risk for traumatic brain injury that may cause problems later in life," said lead researcher Dr. Francis Conidi, from the Florida Center for Headache and Sports Neurology, in Port St. Lucie. 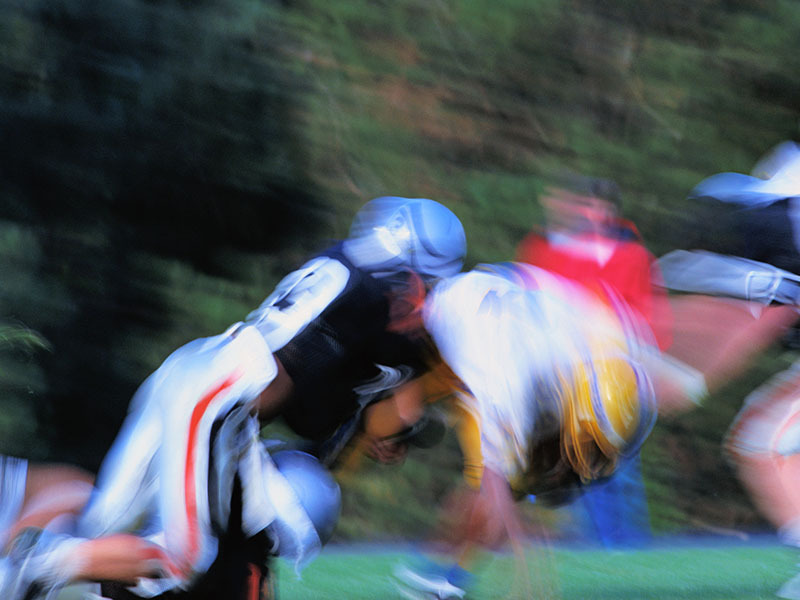 Traumatic brain injury may be a precursor to chronic traumatic encephalopathy (CTE), a progressive degenerative disease of the brain, Conidi said. "It's important to prevent traumatic brain injury, because there is nothing you can do when they reach CTE," he said. Conidi added that one-third of people with traumatic brain injuries go on to develop Alzheimer's, CTE or other neurodegenerative diseases. The NFL, which for years disputed the notion that head injuries led to brain damage, said in a statement that it values studies of this kind. "It is clear there are long-term health risks associated with sustaining head injuries," said an NFL spokesman. "Studies of this nature are important to further advancing the science and better understanding these risks." One way to reduce the danger of traumatic brain injury in football is to limit hitting in practice, Conidi said, "because the damage is most likely cumulative." "You can't take the hitting completely away without compromising the game," Conidi said. However, "there is an accepted risk by the athlete," he added. "As long as we can present the information that you may have problems later in life, they can make an informed decision." Another expert welcomed the report. "Overall, this is a significant study highlighting the potential damage that can occur over time, especially in professional sports," said Dr. Mohan Kottapally, an assistant professor of clinical neurology and neurocritical care at the University of Miami Miller School of Medicine. However, Kottapally said the study findings don't necessarily establish a direct cause-and-effect relationship between the MRI findings and observable thinking problems. More information is needed for that, he said. "The difficulty we face in treating patients with this disease is in determining the connection between imaging findings of dysfunction with clinical findings of dysfunction," he said. The former athletes in the study ranged in age from 27 to 56. They played in the NFL for an average of seven years and reported an average of eight concussions, Conidi said. In addition, 12 men reported several sub-concussive hits -- hard blows that weren't diagnosed as a concussion, he said. When the researchers used special MRIs and examined the brain's white matter, which connects brain regions, they found 17 players had evidence of traumatic brain injury, Conidi said. Also, 30 percent had disruption of the nerve cells that allow brain cells to send messages to each other, he said. It appeared those who played the longest were most likely to have signs of traumatic brain injury. The number of concussions suffered, however, was not related to signs of traumatic brain injury, Conidi said. The explanation must lie somewhere else, Conidi said. One possible cause is that hits during play -- not necessarily head hits -- cause strain deep within the brain's white matter, which result in lasting damage, he said. This may be why offensive and defensive linemen were most likely to show signs of traumatic brain injury, he said. "It's not concussion, it's the banging that appears to be causing the problems here," he added. "We have possibly found a link to CTE or an alternative explanation for some of the neurological problems people are finding in retired football players," he said. The study findings were scheduled for presentation Tuesday at the American Academy of Neurology's annual meeting in Vancouver, Canada. The research should be considered preliminary until published in a peer-reviewed medical journal.